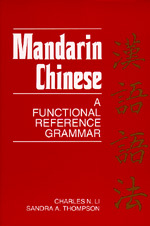 Rights: Not available in "Taiwan, Province of China"
This reference grammar provides, for the first time, a description of the grammar of Mandarin Chinese, the official spoken language of China and Taiwan, in functional terms, focusing on the role and meanings of word-level and sentence-level structures in actual conversations. Charles N. Li is Professor of Linguistics and Chairperson, Linguistics Department, University of California, Santa Barbara. Sandra A. Thompson is Professor of Linguistics, University of California, Santa Barbara.